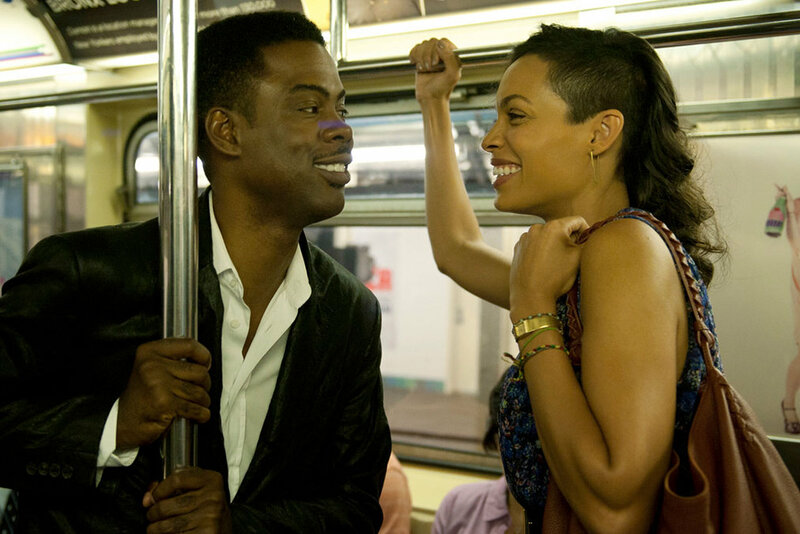 Paramount Grabs Chris Rock’s Top Five At TIFF! Paramount Pictures has won the bidding war to distribute Chris Rock’s third film as a director, Top Five. The film which ‘tells the story of New York City comedian-turned-film star Andre Allen, whose unexpected encounter with a journalist (Rosario Dawson) forces him to confront the comedy career—and the past—that he’s left behind’ – won critical and popular praise at it Toronto International Film Festival premiere. Follow the jump for more. HOLLYWOOD (September 10, 2014) – Paramount Pictures, a division of Viacom (NASDAQ: VIABN, VIA), announced it will distribute writer / director Chris Rock’s “TOP FIVE” worldwide. The news comes as the film from producer Scott Rudin, and his IACF partner Barry Diller, earned rave reviews at the 2014 Toronto International Film Festival. “Chris and I go back decades, both personally and professionally, and so I am particularly proud to have watched his career grow to its highest heights over many decades. This film showcases brilliantly how talented Chris is as a filmmaker and storyteller and we are thrilled to be partnering with him, Scott Rudin and my longtime friend, the legendary Barry Diller and IACF for its worldwide launch,” said Brad Grey, Chairman and CEO of Paramount Pictures. Written, directed by, and starring Chris Rock, “TOP FIVE” tells the story of New York City comedian-turned-film star Andre Allen, whose unexpected encounter with a journalist (Rosario Dawson) forces him to confront the comedy career—and the past—that he’s left behind. Starring Chris Rock, Rosario Dawson, Kevin Hart, Tracy Morgan, Cedric The Entertainer, J.B. Smoove, Sherri Shepherd, Anders Holm, Romany Malco, Leslie Jones, Michael Che, and Jay Pharoah. The film is produced by Scott Rudin and Eli Bush. The Co-Producers are Shawn “Jay Z” Carter and Kanye West; the Executive Music Producer is Questlove. Barry Diller and Scott Rudin’s IACF financed the film. UTA negotiated the deal on behalf of the IACF and the filmmakers. The studio’s negotiating team was lead by Paramount’s SVP of Acquisition and Production Eben Davidson and Rona Cosgrove, EVP of Business Affairs. IAC (NASDAQ: IACI) is a leading media and Internet company comprised of more than 150 brands and products, including Ask.com, About.com, Match.com, HomeAdvisor and Vimeo. Focused on the areas of search, applications, online dating, media, and eCommerce, IAC’s family of websites is one of the largest in the world, with over a billion monthly visits across more than 100 countries. The Company is headquartered in New York City and has offices worldwide. Previous PostStreisand To Appear On Tonight Show!Next PostAnnie Adopts Turnaround Arts!